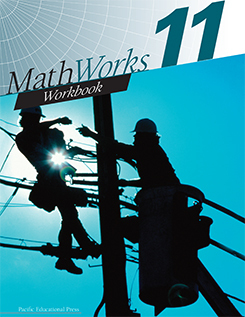 This resource is designed to meet the needs of students enrolled in the Western and Northern Canadian Protocol (WNCP) Workplace and Apprenticeship Mathematics program. This CD contains the Student Resource in PDF and Flipbook formats with hyperlinks and searchable text. 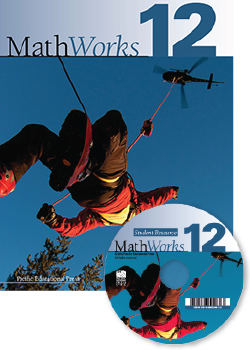 This package includes the printed Student Resource and a CD containing PDF and Flipbook versions of the text. 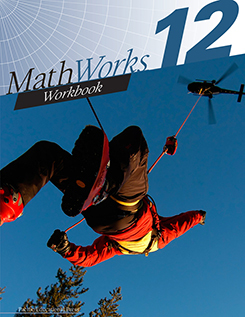 This workbook emphasizes mathematical skill-building through worked examples, practice problems, and differentiated learning strategies. 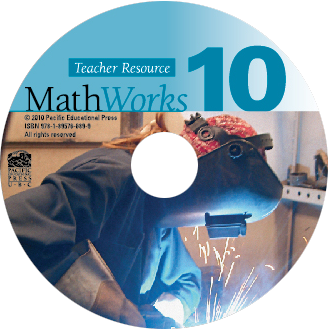 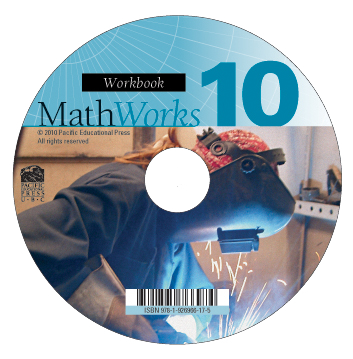 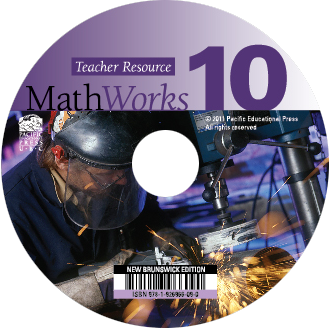 This CD contains reproducible versions of the MathWorks 10 Workbook in PDF, Flipbook, and Notebook formats for teachers to print and/or display to support course instruction. 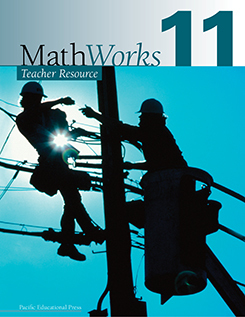 This comprehensive resources offers teaching suggestions and assessment strategies for the Western and Northern Canadian Protocol (WNCP) Workplace and Apprenticeship Mathematics program, supporting the use of the MathWorks 10 Student Resource. 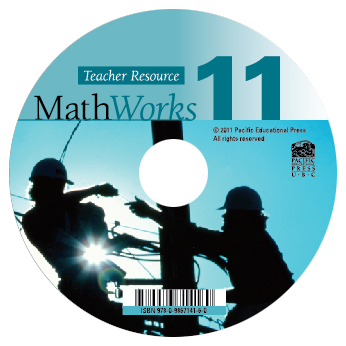 This CD contains the Teacher Resource in PDF format with hyperlinks, searchable text and printable line masters. 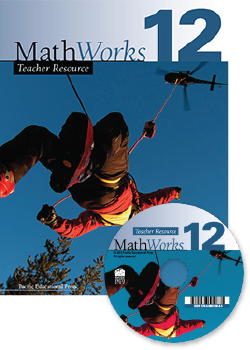 This package includes the printed Teacher Resource and a CD containing a PDF version of the text. 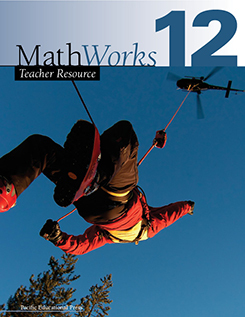 A quick and easy way to generate practice sets, quizzes, and tests to meet your students' needs. 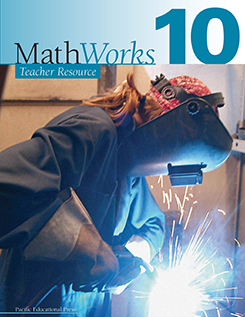 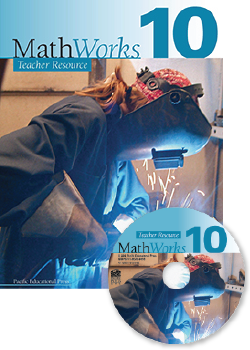 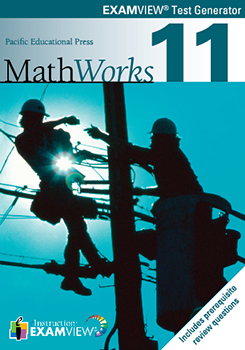 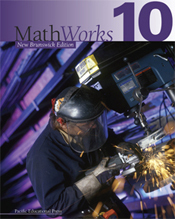 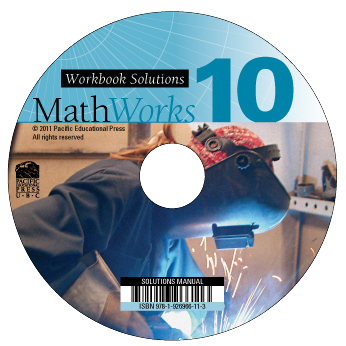 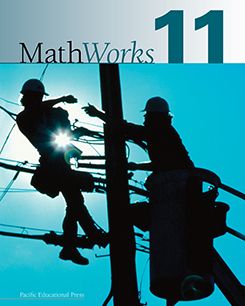 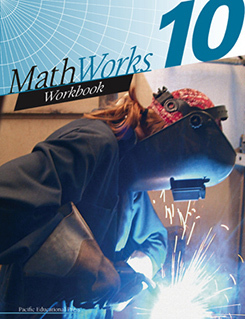 This resource provides complete worked solutions to the questions in the MathWorks 10 Workbook. This licence permits sharing of the digital version of the MathWorks 10 Student Resource with more than one student in a class. 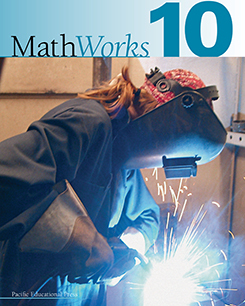 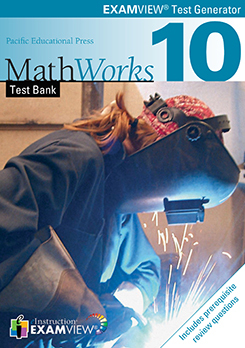 The MathWorks 10 New Brunswick Edition is designed to meet the needs of students enrolled in the Geometry, Measurement, and Finance 10 course. This comprehensive resources offers teaching suggestions and assessment strategies for the Geometry, Measurement, and Finance 10 course, supporting the use of the MathWorks 10 New Brunswick Edition Student Resource. 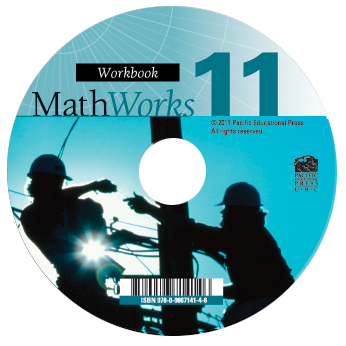 This CD contains reproducible versions of the MathWorks 11 Workbook in PDF, Flipbook, and Notebook formats for teachers to print and/or display to support course instruction. 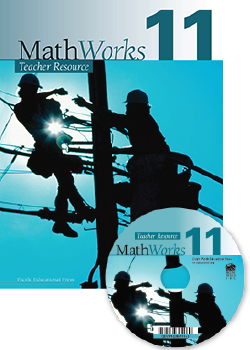 This comprehensive resources offers teaching suggestions and assessment strategies for the Western and Northern Canadian Protocol (WNCP) Workplace and Apprenticeship Mathematics program, supporting the use of the MathWorks 11 Student Resource. 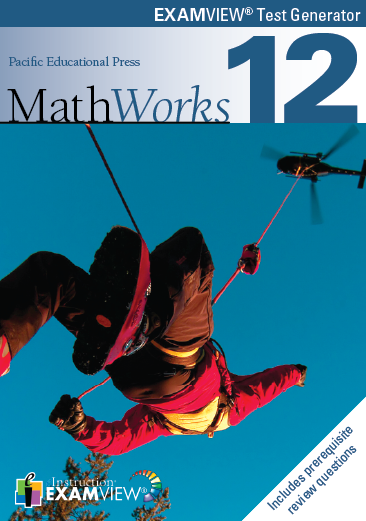 This resource provides complete worked solutions to the questions in the MathWorks 11 Workbook. 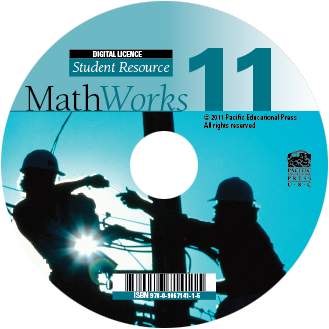 This licence permits sharing of the digital version of the MathWorks 11 Student Resource with more than one student in a class. 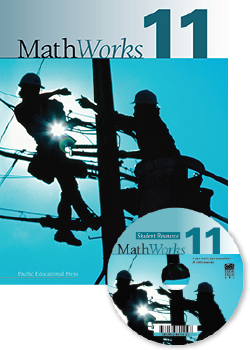 This comprehensive resources offers teaching suggestions and assessment strategies for the Western and Northern Canadian Protocol (WNCP) Workplace and Apprenticeship Mathematics program, supporting the use of the MathWorks 12 Student Resource. 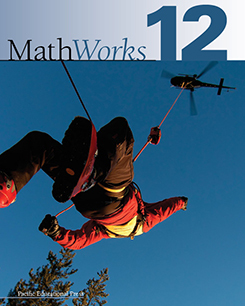 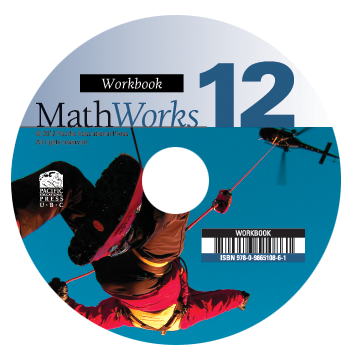 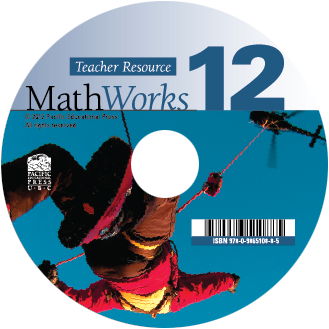 This resource provides complete worked solutions to the questions in the MathWorks 12 Workbook. This licence permits sharing of the digital version of the MathWorks 12 Student Resource with more than one student in a class.